cellF is Guy Ben-Ary's self-portrait but also the world’s first neural synthesizer. 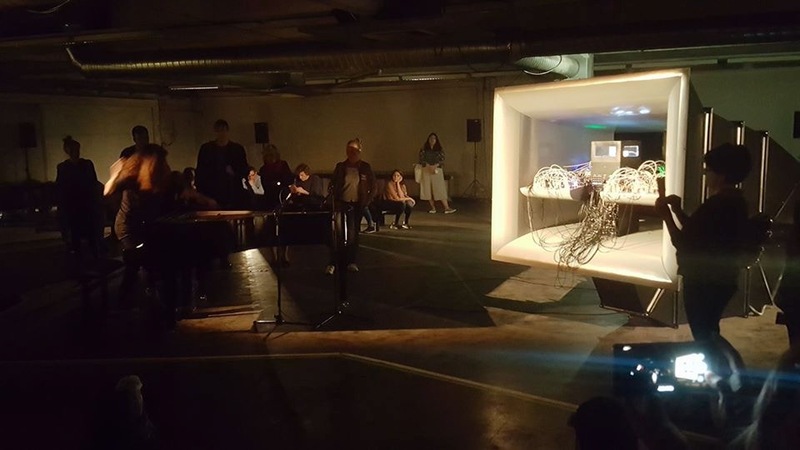 cellF’s “brain” is made of a living neural network that grows in a Petri dish and controls analog synthesizers that work in synergy with the neural network in real time. The performance generated an interaction with the sounds of cellF as it responded to my improvisations on the piano. Each letter in that quote was transcribed to Morse Code, then to short and long notes for flute. Writing music became a process of transferring a situation from mind to paper. To get rid of a torment, a moment, extract it from time, place it elsewhere and let others do whatever they want with it. Interpret it, manipulate it, improvise on it. The reason to notate the score for accordion and flute was to repeat the musical experience at a later time, and evaluate the process of emotional memory in regards to one particular event. Months later, I had become an outsider to the situation that made me write the piece in the first place; It was out there being performed by two total strangers in a public event. The only evidence of the moment ever having existed somehow, were the two foreign musicians as protagonists, the audience as a witness and the musical score and recording as lasting documents. In search of new ways to explore power, religion and identity through art, Sebastian Meissner and Serhat Karakayali invited six musicians from the Middle East and the former Yugoslavia (Manja Ristic, Dror Feiler, Asmir Sabic, Boikutt, Sharif Sehnaoui, Cynthia Zaven) to a one-week ArtLab in Banja Luka (Bosnia and Herzegovina), jointly elaborating and developing a psycho-geographical score that critically describes the mesh of relationships between the two regions and Western Europe expressed through symbolicism, music and sound. My contribution to this project resulted in A Minefield Walk, and in collaboration with Sharif Sehnaoui (guitar), A Minefield Bicycle Ride, both improvised pieces that explore psychological repercussions of a landscape dotted with one millions land mines to this day. These landscapes attempt to burrow into the emotional undercurrents of landscapes that have indelibly shaped European contemporary history. The idea for this workshop originates in the "Lost Spaces" project which focused on the history, the destruction and reconstruction of the Ferhadija mosque in Banja Luka. 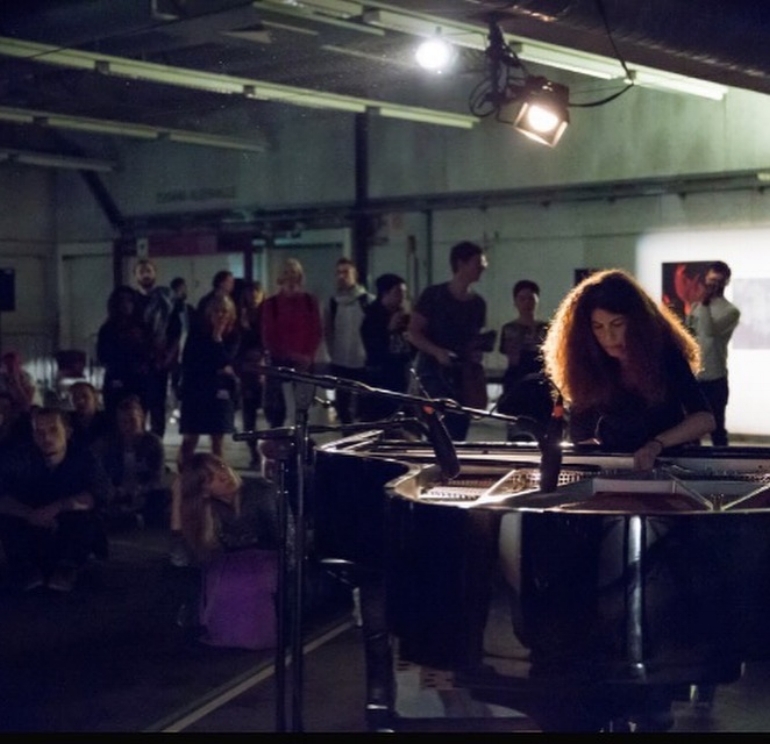 At that time the project was a reaction to a widespread curatorial practice, namely to invite musicians from the Near East to participate as peace ambassadors at European art & music festivals – a practice that ignores the role Europe plays in this conflict. "Not by Note" is a continuation of that project insofar as musicians from this region were invited to reverse the perspective and look at a part of Europe that is as "Balkan" as it is at times expatriated from Western civilization. The project was presented at Kunstmuseum Graz during ORF musikprotokoll at Steirischer Herbst 2010 as a sound-video-graphic installation and an on-site-on-air-on-line ORF Kunstradio broadcast when all those involved in the project once again came together in virtual space. The project Not By Note received an Honorary Mention at Ars Electronica in 2011. One day before my performance, a young Lebanese minister was killed in Beirut; it was part of the long parade of political assassinations that had started with PM Hariri in Feb 2005. I decided not to tune the piano. It suited perfectly with the chaos of the city I was in (Delhi) and the city I was from (Beirut). A different chaos, but one nevertheless. I had taken the piano out of its normal 'habitat' therefore de-contextualizing an ordinary setting, and was using it to interact with a city that was not mine in a language I knew best. We drove around the busy roads of Delhi with me sitting in the back improvising on the piano, challenging the instrument to connect with the urban environment, almost like trying to fit in a place I didn't belong to. Some drivers would beep back, some would just stare in awe thinking it was a movie that was being shot. Feeling the instrument turn into a purely sonic interface to communicate with cars, rikshaws and trucks was both an intense and painful experiment... and after 2 hours on tortuous roads, the soundboard disconnected from the piano that eventually gave up. The tower designed by Austrian architectural studio Coop Himmelb(l)au for the Swiss Expo, an event that occurs once every 25 years, was the supporting beam for an interactive musical instrument. A unique audio system comprised of 72 physical channels and over 40 loudspeakers produced a virtual acoustic kaleidoscope. Vertical whirls acted as background for the projection of the most varied sound experiences. The sound stream was based on a weekly composition which reacted to the environment on seven different aural levels and could be altered and structured live by musicians. I was invited to perform inside the tower during the Swiss Expo in August 2002, in collaboration with the initiator of the project, Andres Bosshard (live electronics). The sound tower's shell, open at the top, concealed more loudspeakers. Microphones caught the hum and murmur of the crowd along with the music performed on the piano and relayed them to the sound direction capsule, hung at about three meters height, where Andres would direct and alter the mix of sounds, before transmitting them on 72 channels.